The headquarters of Lamar Construction Company in Hudsonville, Mich., seems to be floating on air above the workshop and warehouse. Virginia Tech architecture professor, Mehdi Setareh, a structural engineer, tested the building to ensure that vibration would not interfere with it's use for offices. BLACKSBURG, Va., Oct. 20, 2010 – The American Institute of Steel Construction has presented a national award to a design team, including a Virginia Tech structural engineer, for its work on a dramatic cantilevered corporate headquarters in Michigan. Mehdi Setareh, of the School of Architecture and Design, is an expert in structural vibration problems. He used his expertise to help design and build the headquarters of Lamar Construction Company in Hudsonville, Mich., in collaboration with Integrated Architecture, Grand Rapids, Mich. The 5,200 square-foot glass and steel structure that houses offices perches16 feet above the company’s workshop and warehouse in such a way that it almost appears to be hovering in air. 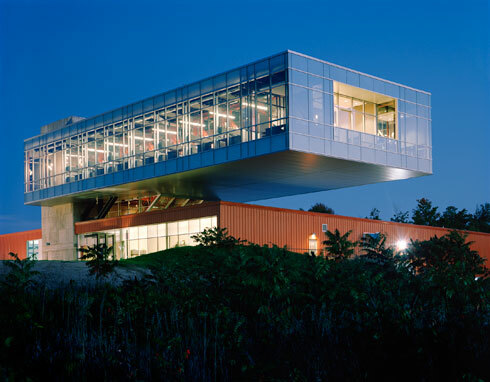 The overhang is 113 feet long, which makes it the longest cantilevered office building structure ever constructed. Because of the unusual design, the architects needed to ensure that vibration was minimized so that that building would be secure and comfortable for people officed there. “I was in charge of the design to prevent vibration problems the building could have because of the unusual and complex geometry,” said Setareh, a professor in the College of Architecture. “I did the dynamic analysis and testing and the design of the turned mass dampers.” The turned mass dampers are elements that could be used to lessen vibrations in the building if needed. The American Institute of Steel Construction bestowed a 2010 National Award for Innovative Design in Engineering and Architecture with Structural Steel in the projects less than $15 million category on the Lamar project team. One of the judges of the competition, Jennifer Richmond, vice president Novel Iron Works, Inc., Greenland, N.H., commented on the uniqueness of the building, which was a factor in the award. Setareh earned his bachelor’s degree at Sharif University of Technology, Tehran, Iran; his master’s degree at the University of Surrey, Guildford, Surrey, England; and his doctorate at the University of Michigan, Ann Arbor, Mich. The American Institute of Steel Construction annually recognizes projects that utilize structural steel in an innovative manner. The judging criteria is based on aesthetic and visual impact of the project, innovative uses of architecturally exposed structural steel, advances in the use of structural steel, use of innovative design, sustainable design and creative solutions to the project’s program requirements. Virginia Tech’s College of Architecture and Urban Studies is composed of four schools: the School of Architecture + Design, including architecture, industrial design, interior design and landscape architecture; the School of Public and International Affairs, including urban affairs and planning, public administration and policy and government and international affairs; the Myers-Lawson School of Construction, which includes building construction in the College of Architecture and Urban Studies and construction engineering management in the College of Engineering; and the School of the Visual Arts, including programs in studio art, visual communication and art history.